Northern League Football between Sunderland RCA (red/white) and Shildon, played at Meadow Park, Ryhope. Striker Colin Larkin has urged Sunderland RCA to bounce back from two successive defeats. A midweek derby defeat against Ryhope CW was followed up by Saturday’s home loss against Shildon as goals from Daniel Moore and Matty Robson gave the Railwaymen all three points at Meadow Park. 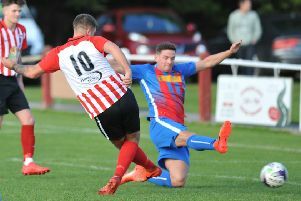 The Northern League fixture list has offered RCA a chance to get back to winning ways when they entertain Whitley Bay on Tuesday night and Larkin wants his side to show the right attitude to claim all three points. “I think the Ryhope defeat was a shock, but it was down to our mindset,” explained the former Gateshead striker. “I think everyone in the club expected us to win the game, especially with it being a big opportunity to go top of the table. “Shildon are a quality side and they have always been a bit of a bogey side for us. “We need to bounce back quickly and fortunately there is a quick turnaround in fixtures. “Tuesday can’t come quick enough and we have to react to the last two games. 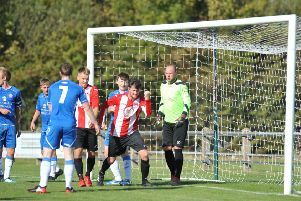 Ryhope failed to build on their derby win against RCA after a Ryan Carr goal condemned them to a narrow defeat at North Shields. The loss means that Gary Pearson’s men couldn’t extend their winning run to four games, but assistant manager Stu Gooden believes that his side deserved at least a point from their visit to North Tyneside. He said “It was a very tight game and both sides cancelled each other out to be honest. “We had some fantastic chances to get back in the game after giving away a scrappy goal but we didn’t take them. Hebburn Town are sat top of the Division One table after goals from Paul Chow and Graeme Armstrong helped them to a 2-1 win at West Auckland Town. Bishop Auckland lie in third thanks to their 4-1 win at Whitley Bay. Kyle Fryatt gave the Two-Blues an early lead but they were pegged back ten minutes into the second-half by a goal from Bay top scorer Jack Foalle. But a Shaun Ryder strike and a brace from Andrew Johnson moved Bishops into the top three and gave manager Ian Chandler a winning return to his former club. Dunston UTS’ season continues to get better and better after they took all three points from their home game against Consett. Jake Stafford’s free-kick put Dunston ahead on three minutes but a Michael Sweet penalty meant that their lead was short-lived. But Chris Swailes side secured a sixth win in seven league games thanks to a Liam Brooks goal nine minutes before half-time. Mark Doninger marked his Whickham debut in fine style as his hat-trick inspired the Lang Jacks to a 4-0 win at Penrith. Penrith player-manager Kyle May left the club by mutual consent on Sunday morning. Nathan Mulligan, Sonni Coleman and Mikey Roberts got the goals for Stockton Town in their 3-1 win at Guisborough Town and Newcastle Benfield and Ashington shared the points after a 1-1 draw at Sam Smith’s Park.